Healthy Thanksgiving eating for children doesn't have to be a challenge. With a bit of planning, kids can enjoy this wonderful fall celebration and still eat well. During the Festive Season, which runs from Thanksgiving through Christmas and into the New Year, everyone tends to eat more, simply because of the sheer volume and variety of treats being offered. Children are no exception, and they should be able to enjoy special foods at this time of year, within reason. When children get hungry, they want something to eat that requires little prep time, and fresh fruits and veggies fit the bill very nicely. Put a bowl of fruit on your kitchen counter or table and encourage children to choose something from it at snack time. Another option is to keep a bowl of cut-up fruit in the refrigerator so that all members of the family can enjoy it whenever they are looking for a snack or a healthy dessert. Fresh vegetables can also make a great snack for all members of the family. A plate of cut-up veggies with dip or plain yogurt is something that children will enjoy. By offering healthy choices like these as part of the Thanksgiving celebration, children can eat well and still enjoy the occasion. 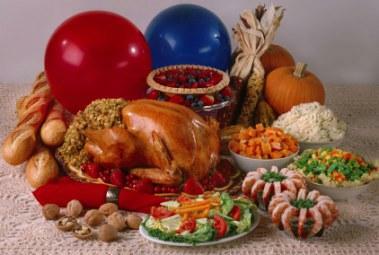 During holiday times, your main focus may be on the big meals where a number of people gather. Eating a few larger meals in the company of family and friends doesn't mean that you or your children have abandoned the idea of healthy eating. You can still choose to serve low-fat or fat-free dairy products, whole grain breads and cereals, and lean meats. If you are doing your own baking, you can substitute a portion of the white flour called for in recipes for whole wheat instead. Children are more likely to be interested in eating healthy foods when they have been given a chance to help in the kitchen, so do make a point of including them whenever possible. It would be unrealistic to expect your child to shun desserts and other yummy treats entirely. Instead, allow your child to have these kinds of foods in small portions divide up a full-sized dessert into a half or one-third portion. That way, your child can get a taste of these foods without overloading on them. You could also have your child tell you what kinds of treats they like the best and make sure you serve them. If you know that your family will eat foods high in sugar and/or fat simply because they are available, limit them to the top couple of choices only. When you are not serving these items, be sure to store them out of sight. If more nutritious choices are readily available, your family will be more likely to eat them rather than take the time to look for other snack foods. Thanksgiving and the Holiday Season that follows it are a wonderful time of year. It is possible to make sure that healthy Thanksgiving eating for children doesn't get lost in the experience. If children learn from a young age how to eat well at all times of the year, they will draw on these experiences as they grow into adulthood themselves. Keep in mind, too, that children are more likely to mimic what they see rather than what the adults in their lives tell them. Make sure that you are making healthy choices about food yourself.